Back to school season is here and it’s just as exciting as when Nate started kindergarten last year. He’s moved onto the first grade and is officially a pro at the back-to-school routine. It’s so crazy how fast time is flying! Summer coming to an end is always bitter-sweet. We’re all going to miss those long, hot days, but there is also so much to look forward to in the upcoming months. I’ve been trying to remind Nate that as he’s overcoming his first week back blues. He likes school, but everyone dreads the rigid routine! One thing that always gets me excited is shopping for the new seasons. 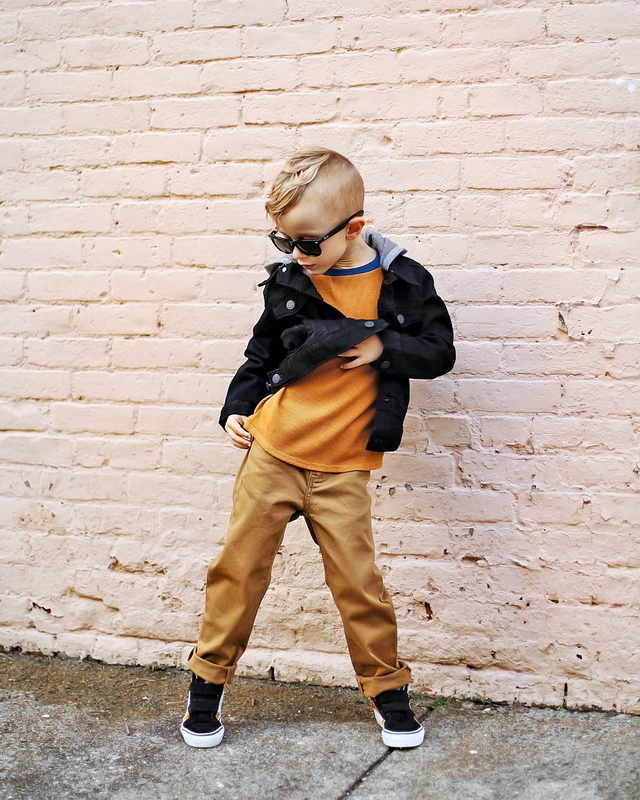 We partnered up with Old Navy to show you some cool fall colors and alternate denim options. We went all in for fall and opted for colors that remind us of the changing of the leaves. That is one of the prettiest things about fall! Our last coordinating outfit from Old Navy was somewhat collegiate and sporty, so we decided to switch things up a bit and go for a little grunge. 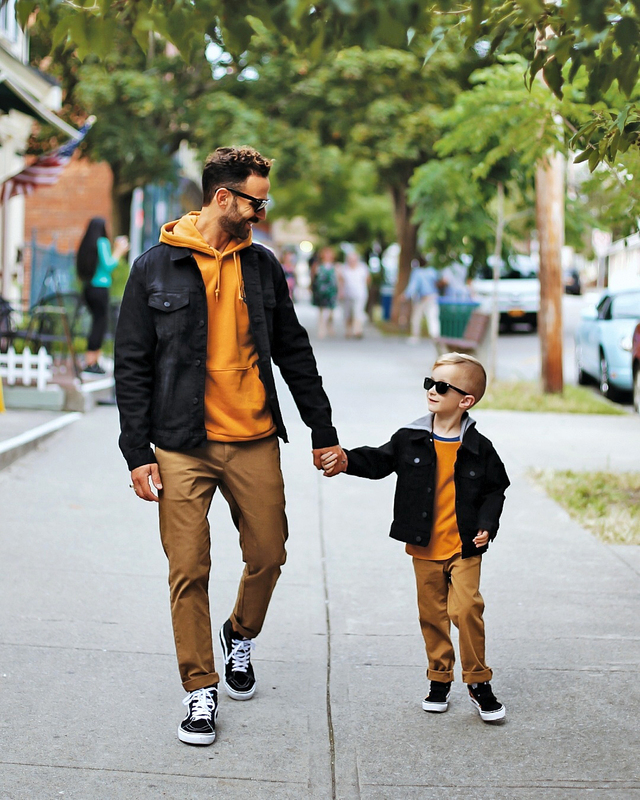 Nate and I are all about that street style! 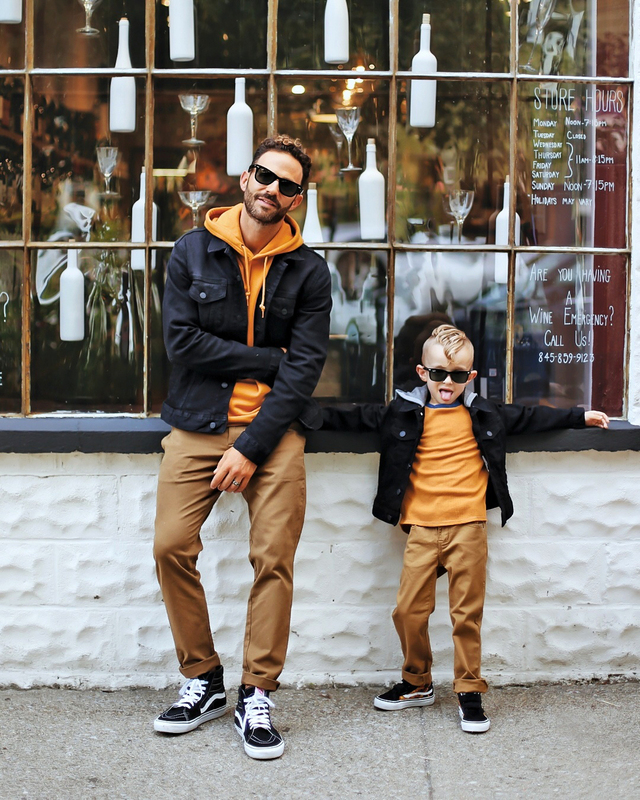 I really love how I was able to find almost the exact mini-me look for Nate, to coordinate with my outfit. I can’t express enough how cool I feel when we’re walking down the street and we hear the people complimenting us both on how cute we look together. No matter how good I think I look when I’m walking solo, I can’t buy a compliment LOL, but when we’re in our matching Old Navy outfits, they are just thrown our way. Haha. We started our looks with matching black denim jackets. I wore the Built-In Flex Black Denim Jacket which has just the right amount of give in the denim, and Nate wore the 2-in-1 Hooded 24/7 Black Denim jacket. For me, I actually don’t like wearing denim jackets with built-in hoodies, but for Nathan I think they’re perfect! They give that little bit of grunge vibes that we like, but don’t add that bulkiness that will make him uncomfortable. 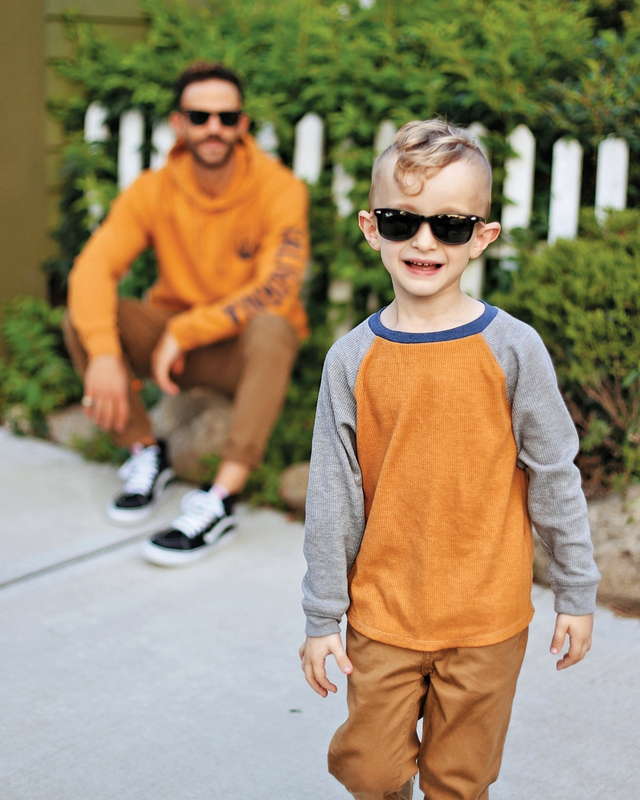 I really like how Old Navy uses the exact color tones in both the Men’s and Boy’s collections. If you look at our outfits you would think that we’re wearing the exact same pieces, but really it’s just the exact same colors! I love the tobacco leaf color of this Pullover Hoodie and Nate’s matching Color-Blocked Thermal-Knit Raglan Tee. The colors are described differently…Nate’s is Golden Brown, but they literally match to a Tee! Get it? LOL (corny dad joke alert) The one thing I love about Old Navy is that I always feel super comfortable in their clothes. You know when you have to go out, but are in no mood to get dressed up and just feel like wearing sweats? In these cases I always end up throwing on an Old Navy look instead. I get that same kind of comfort, without the sloppiness of sweats! I’m pretty sure it’s because a lot of their pieces have the built-in flex. Nate loves it and I can definitely see why. The Relaxed Slim Khakis are just what I’m talking about and with the Warm Bread color, this look can’t get any more fall! Now every time I see this color I think of warm banana bread, which is my favorite, and it always has me craving a piece LOL. Nate wore the Karate Built-In Flex Slim Jeans, that he calls his “comfy pants”. We have yet to tell him that they are actually brown jeans! haha We always have a hard time getting him to wear jeans because he associates denim as a stiff & uncomfortable material, so we’ll just stick with also calling these his “comfy pants”. I mean I love all kinds of denim, but I totally understand how an active little boy might hate wearing traditional denim, that’s why the built-in flex is perfect for him! 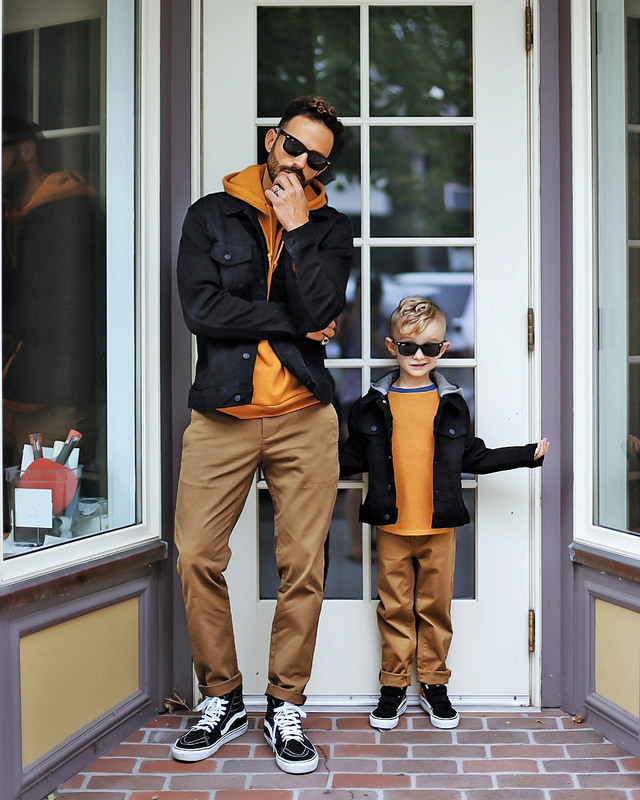 What do you think of our twinning Old Navy looks? 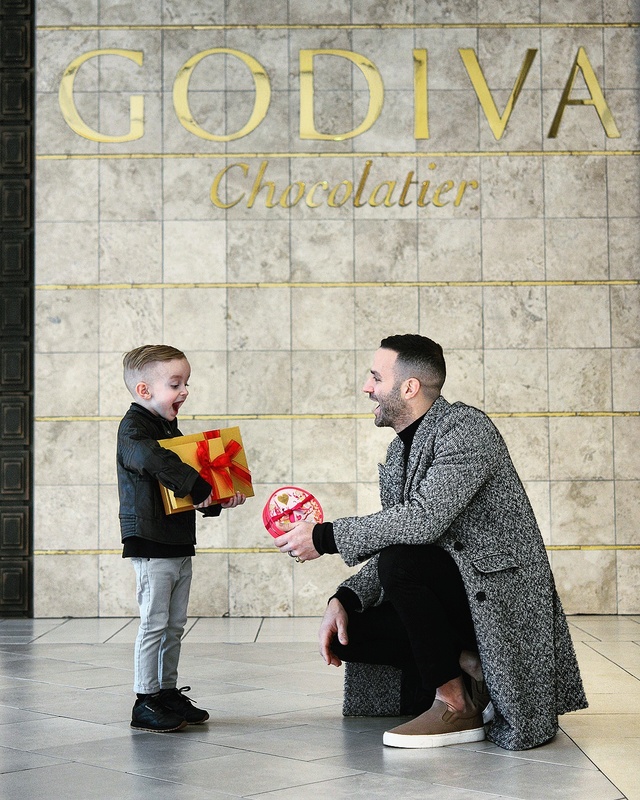 Comment on our post if you’re a dad that likes matching your little man!